The new iOS10 has some great new features. But the best one is a secret, personalized for every user, and yours can only be found by you. Here’s how I found mine. I’m a geek. If you read this blog, you know I love tech, gadgets and toys. I get my greasy, adolescent-fantasy hands on anything I can play with. If it’s new or different, I am magnetically attracted to it. An eternal kid. After updating to iOS10, I saw the iPhoto app enhancements almost immediately, as everyone did. A few hours after updating, my phone had magically arranged some of my pictures of my children into an album, with a title based on the geo-tagged information, and set to music. The new gallery called to me to tap and open. 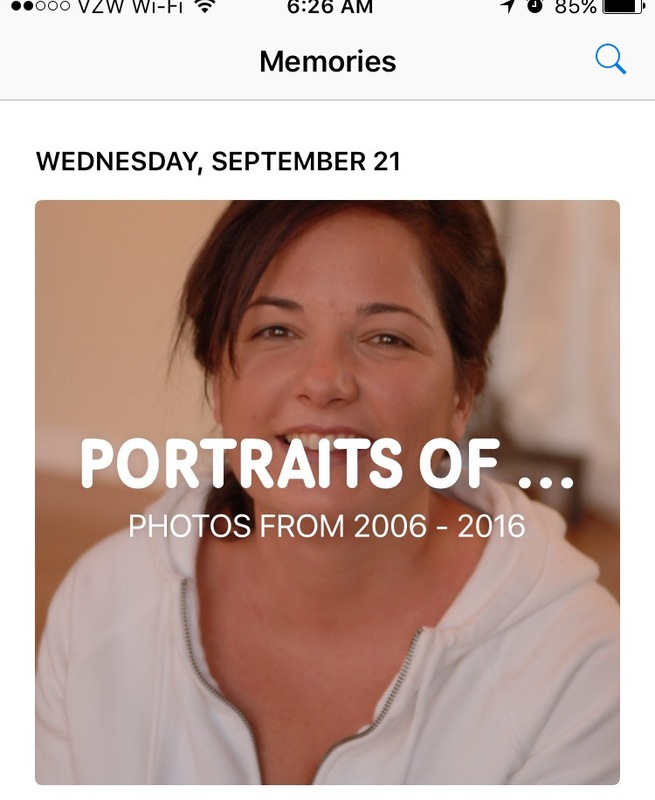 But just today, a set of images popped up titled “Portraits 2006-2016.” They were pictures featuring images of my wife, Katie, over the 15 years we have (so far) spent together. Photos of us in the first years we met dissolved into our wedding day; then the arrival of our two children; then rewinding backwards to vacations and holidays with our extended family; and sprinkled over with memories of back to school and birthdays, new homes and old neighborhoods, soccer matches and baseball games. As the photos danced across my screen, chronologically out of order but still thematically linked, I watched Katie’s face closely. First she was younger, then older; first a girlfriend, then a bride, then a mother; first on a beach then on a delivery room operating table; first hugging me, then clinging tight to our children, who gripped her in loving return. In every image, her smile never waned, but over time, an evolving feminine wisdom spread across her face, the kind that only comes attached to those life-altering experiences one never expects or plans. In those images, a family began to gather around her and the dynamic shifted. Her presence became larger and grounded each passing photo, altering the hierarchy of those memories in an instant. She became the foundation of everything I saw. What had once been defined by an occasion or location dissolved entirely; replaced by the presence and power of this wonderful woman who was now the center of my narrative. That’s when it hit me like a ton of bricks. In our frenetic day-to-day existence, I might not have been confronted with such visceral evidence of how strong and beautiful and essential a gift my wife is to me and my children, and what a dramatically irreplaceable role she has played in defining our very existence. We all play a unique role in each other’s lives, but none so much as the partners who choose to love us. As my photos morphed, one into the next, it became wonderfully clear that none of us – me, our children, or our extended family – would exist as we do without her. Don’t mistake me – I love and value Katie every day. I miss no opportunity to say “I love you,” and to teach our children then same. Honor, respect and gratitude are themes which hang (literally) on the wall of our home. We know how important- and how important letting her know how important – she is. But those images, stitched together by a phone, an inert object, in a completely random way and over the most generic of music beds, was an electro-magnetic pulse that cascaded over my brain. Stopped in my tracks, I could only stare and smile, as a tear formed in the corner of my eye. This was my whole universe, in a 60-second movie, auto-generated by an app, and more mind-blowing and joyful than any physical photo album I had ever held in my hands. That is the power of the best of technology, which goes beyond digital code to reach out and touch us; technology that speaks to our hearts and to our souls; technology that brings us together in unanticipated and surprising ways that have lasting impact. Thanks, iOS10 and its creators, for uniquely remindimg me what an amazing person I found, married, and with whom I created a family, a life and an identity. I’m looking forward to what “Memories 2016-2026” will be. Now I’m headed to buy some flowers.